Select App Center from the side navigation bar under settings. Scroll below existing connections and click Install More Apps. Once you click the button, you will be asked to sign into your account, if you aren't signed in already. When you are signed in you will be brought to a permissions page. 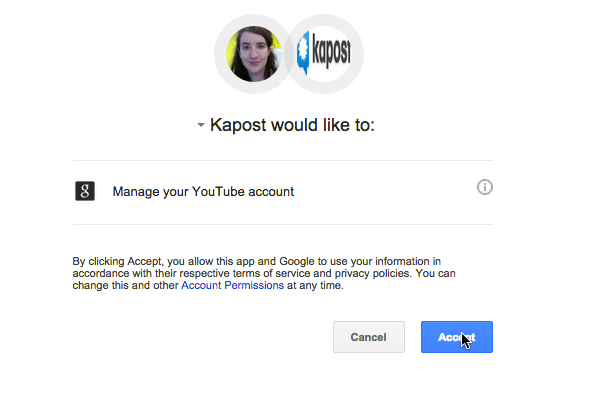 Accept all permissions and your Kapost account will then be connected to YouTube. Your new connection will appear in your list of destinations. Once you have Added YouTube in your app center, you must set this up as a primary destination for a content type with a video body. You can learn how to do that here: http://j.mp/p1Plqi. You will also want to add custom fields so that your tags, description, categories and playlists pull through. Now you can create a YouTube video post! Add a video by clicking the blue "Add Video" button, and fill out your custom fields. When you are ready to publish a YouTube post, you will see 3 options - Update Metadata, Updata Metadata as Unlisted and Update Metadata as Private. If you are using a custom field to control your privacy on YouTube, you only need to use Update Metadata and it will default to whatever your custom field says. If you are controlling your privacy from the publish area without a custom field, Update Metadata will assume your video is public. Choose Update Metadata as Unlisted to publish your video as unlisted and Update Metadata as Private to publish your video as private. Please note, once a video is published, YouTube's API will not allow you to update the video - you can only update the metadata. 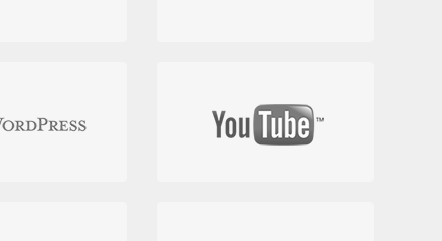 Kapost uses YouTube’s API to display the following metrics on published videos. Note: Kapost captures YouTube activity two days after it occurs. Views: The total number of times the given YouTube video was viewed. Favorites: The total number of times viewers favorited the given YouTube video. Comments: The total number of comments viewers made on the given YouTube video.